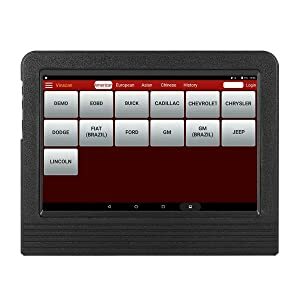 Launch X431 V+ is a tablet diagnostic tool for professionals who want to conduct a full system diagnosis to find faults in the car. 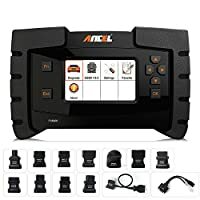 This scanner can help you perform bidirectional tasks and use advanced features such as ECU coding, key programming, TPMS, ABS bleeding, SAS, DPF, and many more. It is one of the few tools to offer such a wide variety of functions. Launch X431 V Plus covers a wide range of features and is also very easy to use. If you want to provide exceptional service to your clients, then consider investing in this one. It can study several vehicle systems including the engine, transmission, ABS, SRS, communication, and chassis. It can read trouble codes related to these systems and provide definitions to help you understand and solve the issues. You can even diagnose the car in real-time by enabling the live PCM data stream to find out which components lack performance. 2 Who Should Take It? 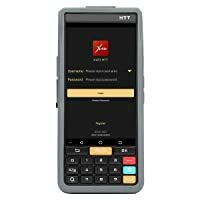 This scan tool can be connected to a phone or tablet using the Bluetooth technology. The system works fast making it easy to run tests. EPB (Electronic parking brake) is a feature that helps keep the vehicle stationary on flat and steep roads. Issues with the system can put your vehicle at risk. With the Launch X431 V Plus, you can diagnose faults in the EPB system and solve problems in no time. Launch X431 V+ can read and erase oil reset trouble codes after you change the oil. The discharging of air from the ABS modulator is called ABS bleeding. It helps improve the performance of the brake system and ensures your car remains safe to drive. With this diagnostic tool, you can perform ABS bleeding all by yourself. 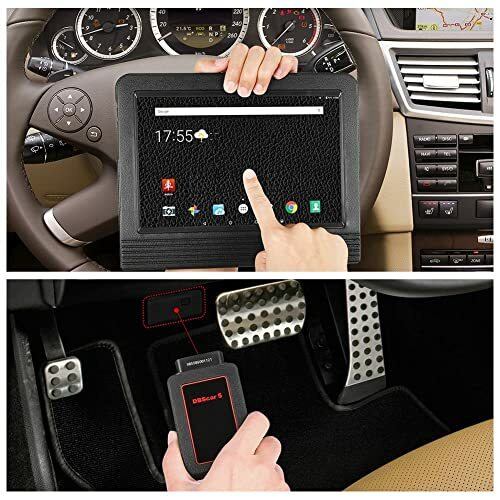 This automotive diagnostic tool monitors the rate of turn of your steering and also lets you adjust it. Launch X431 V Plus is the convenient scanner with 11 outstanding functions. This scan tool lets you turn off the ignition, starter motor, and fuel system until the right key is used. This feature helps keep your car safe and secure. The scan tool lets you reset the battery without any trouble. 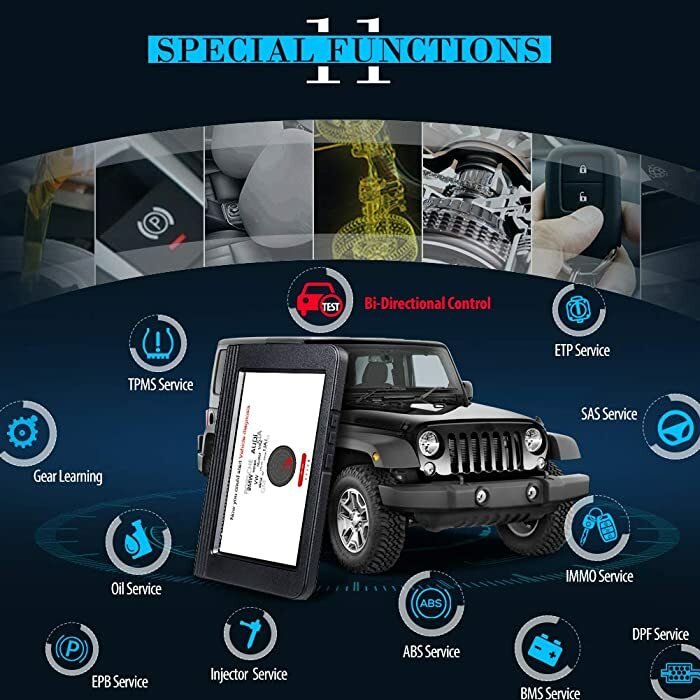 This Launch scanner offers ECU coding as well. You can alter the configuration when a component is replaced. However, this feature should only be used by professionals as things can go wrong if you are not skilled enough to handle ECU coding. Tire Pressure Monitor System lets you monitor the state of your car’s tires. This feature helps diagnose the tires for inflation or overpressure. It ensures the tires are adequately pressurized at all times. It’s a useful feature because tires can burst or cause the vehicle to disbalance if there isn’t enough air pressure. An issue with the system can put you at risk. With Launch X431 V+, you can reset TPMS and ensure safety. The diesel Particulate filter is an integral part of a vehicle as it captures soot and reduces emission. However, since the filter has limited storage, it needs to be discharged once it gets full. With Launch X431 V+, you can get rid of stored soot and even find faults in the DPF system without any trouble. This feature is used to increase the engine’s RPM by matching it to the REVs when downshifting. The ETS, Enhanced Traction System, monitors the speed of wheels via ABS. Launch X431 V+ reads ETS related codes and help you find problems with the system. You can perform injector coding with this diagnostic tool. Launch X431 V Plus can help you manage the fuel pump and A/C clutch. Moreover, you will also be able to perform an EVAP emission test with this beauty. You can download updates from the official Launch website by selecting the product. However, the updates are free for the first two years only. Launch X431 V+ is easy to use due to it is compatible with most of cars. The scanner supports all Asian, American, and European cars that are manufactured in 1996 or later. It covers 90% of new brands including Citroen, Jeep, Chrysler, Ford, Dodge, Skoda, Opel, Porsche, Rover, Audi, Lincoln, Honda, Acura, Lexus, Mazda, and Nissan. 5 MP camera and 7000 mAh battery. Compatible with supercars such as Ferrari, Maserati. Updates cost $400/year after the first two years. This scanner is for professionals, mechanics, and auto repair stores. It can help shop owners and professionals solve problems quickly. Users who know a lot about cars may also opt to buy it as it offers a bunch of advanced features. Launch X431 V Plus is made with professionals in mind. It covers a wide range of features and is also very easy to use. If you want to provide exceptional service to your clients, then consider investing in this one. Can You Use The Tablet To Browse the Internet? Yes, you can. The tablet has WiFi support that lets you browse the web. How many languages does the scanner support? It supports a total of 24 languages. Can the product be shipped internationally? Yes, but that depends on where and who you buy it from. Do I need to buy a case to protect this tablet? Not really. The tablet scanner is dust/damage/drop/water/ grease proof. It is said to be okay for use in the rain as well. Moreover, the tablet is quite durable. Hence, a case is not needed. Will this do a VIN relearn?